Christmas Night Season's Greetings Cards by Desktop Publishing Supplies, Inc. are certified to impress your friends, family, or clients this holiday season! These exquisite Xmas cards are printed on a beautiful semi-shine cardstock and feature a classic Christmas Night scene with Santa & his reindeer flying in a moonlit sky over a snow covered town. The inside of the card is blank for your customization. Christmas Night Holiday Cards are packaged flat so you can run them through your printer for easy customization! Print a customized message, your favorite Christmas phrase, or even add photos to the inside of this Holiday card. 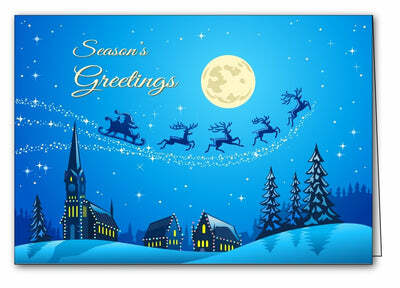 Our Imprintable Holiday Cards are made from a semi-shine Matte, 80lb Cover (218gsm) Inkjet & Laser Compatible cardstock. These Holiday Cards measure 5" x 7" when folded and are pre-scored for easy folding. A matching amount of white envelopes are included.